852715 Star Wars Magnet Set is a Star Wars magnet set released in 2009. Included are Darth Vader (Battle Damaged), a Snowtrooper, and a Shadow Stormtrooper. This is a description taken from LEGO.com. Please do not modify it. Your fridge has a dark side! The Empire is on the march -- across your fridge! 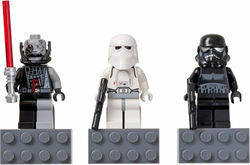 These authentic LEGO Star Wars Battle-Damaged Darth Vader, Snowtrooper and Shadow Trooper minifigures include magnetic attachments to stick to refrigerators and other metal surfaces. Includes lightsaber and blasters! Facts about "852715 Star Wars Magnet Set"
ShopDescription Your fridge has a dark side! Your fridge has a dark side!